The Complete Direct Investing Handbook provides comprehensive guidelines, principles and practical perspectives on this increasingly attractive private equity investment strategy. Interviews with leading family office investors, qualified private equity buyers, and top direct investing advisors provide essential insights, and attention to the nuanced processes of direct investing. The books is a hands-on resource for family offices and those investors interested in generating returns through private company ownership to be more effective in creating returns in a complex market. Direct investing best practices are explored in-depth, with guidance on strategy and the evaluation and assessment of various investment opportunities. The process begins with a codified and specific investment goal, and a robust strategy tailored to the investor's individual needs. Useful insight on 'narrowing the field' helps investors select the appropriate opportunities to meet their investment goals, and practical tools help streamline the process of capital deployment and in turn providing more opportunities to achieve desired returns. Despite the growing interest in direct investing, there is little public information available to investors and there is a lack of transparency into practical standards. This book bridges the gap between strategy and execution, with comprehensive guidance and real-world insights. Historically, extraordinary wealth has been created through equity in privately-held enterprise. Today, family offices and direct investors are looking more and more toward large capital deployment in early-stage and growth-oriented private equity investments, but are constrained by a lack of informed, established practices. 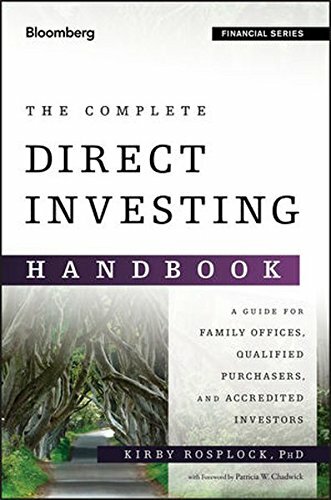 The Complete Direct Investing Handbook provides the much-needed guidance and tools that can improve direct investment outcomes.